LONDON, April 13, 2018 – The parents of baby Alfie Evans have lost custody over their son and he has now become a “ward of the court,” effective noon today. The news was shared by the family’s media coordinator. “We are outraged that in further legally indefensible steps during the night, the hospital obtained a faxed order making Alfie a ward of the court, removing parental rights from Tom and Kate over their son Alfie, taking effect at noon today,” a press release authorized by the family’s legal team states. The news comes after Alfie’s parents Tom and Kate attempted to remove their child from Alder Hey Children’s Hospital in Liverpool yesterday afternoon after being assured that Alfie was neither a “prisoner” nor a ward of the court. They had a medical team prepared to transport Alfie to a plane standing by. Alfie’s family want him to receive treatment at the Bambino Gesù hospital in Rome. However, the hospital called police, who threatened to arrest Alfie’s father for assault if he took his son. “Alder Hey hospital called in police to stop Alfie’s transfer, locking all doors, setting off a fire alarm and removing all children from the PICU. This merely proves first that Alder Hey is acting in violation of parental rights, second that Alfie is indeed a prisoner if the police are being used, and third their tactics are simply hysterical,” states the press release. 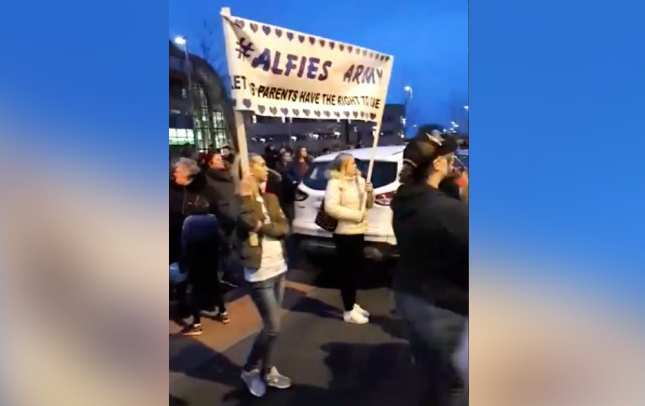 Hundreds of “Alfie’s Army” supporters surrounded the hospital yesterday evening, demanding the release of the sick child. They blocked the roads for hours while allowing free passage of pedestrians and ambulances. ‘Alfie’s Army’ supporters show up in front of Alder Hey hospital, April 12, 2018. Later in the evening, Alfie’s dad told supporters that he had been threatened by police with arrest for so much as touching his son. “If I take Alfie, I’m gonna get arrested for assault,” Tom Evans said  he was told by police. “If I pick Alfie up, with legal responsibilities and parental responsibilities, I’m getting told that I’m gonna get arrested for assault.” He made the comments in a Facebook Live video recorded outside the hospital. A court order was handed down Thursday, mandating Alfie be kept on life support until Monday, when the boy’s parents and legal team will again return to court in yet another attempt to keep their son alive. They will ask a Court of Appeal to allow their 23-month-old son to remain on life support and receive further treatment for his undiagnosed condition. They claim that Alfie has been illegally imprisoned (Habeas Corpus) by the hospital. The parents hope to move their son to a different location so he can receive better treatment. The position of Alder Hey Children’s Hospital is that dying is in the child’s best interests. “The family wishes to immediately move Alfie by air ambulance to the Bambino Gesu hospital in Rome, which has offered free care for the rest of Alfie’s life, including the comfort and health-enhancing standard tracheostomy and PEG feeding tube which Alder Hey refuses to give,” the press release states. “We can only imagine what could happen when Alfie receives proper diagnostics and standard humane care, and the parents are prepared to love and care for their son in any case,” states the press release.